Hope the new year is off to a good start for you and your family! 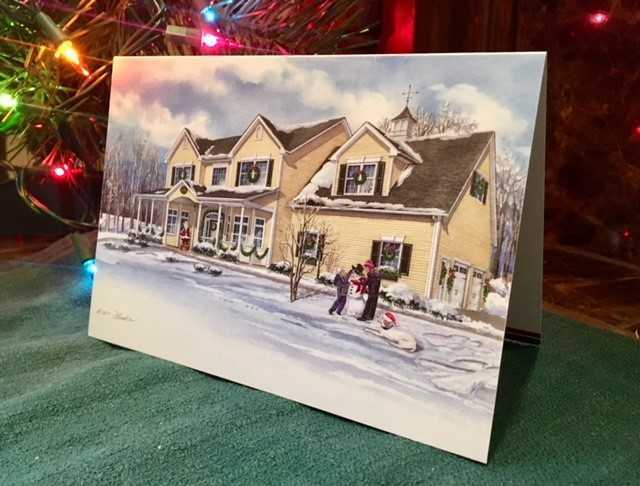 Over the holidays, I received this 5″x 7″ Christmas greeting card from a family in Pennsylvania and it made me smile. On the front is the image of the 15″ x 24″watercolor house portrait I did for them earlier in 2018, showing their lovely residence in festive holiday decor while their two children and dog play in the snow. I was happy to give permission to use the artwork image when they asked, and now see that it reproduced beautifully on the small format. I hope the family enjoyed sending their unique Christmas card to family and friends!